Supernovae are some of the most energetic events in the Universe and are mostly caused by the chaotic end stage of a dying star. At the ICG, we are mostly interested in one particular type of supernova, namely a Type Ia Supernova (SNeIa) which is believed to be the thermonuclear explosion of an accreting oxygen-carbon White Dwarf star (although this physical explanation is under review lately). These supernova are interesting because they are some of the brightest supernova in existence, and can be seen to great distances, and astronomers have shown they can be “standardised”, i.e., their peak brightness can be scaled appropriately to make them all the same, thus making them ideal cosmological probes. In 1999, two groups of astronomers used tens of distant SNeIa to measure the expansion rate of the Universe and made an amazing discovery. They found that the expansion rate was accelerating, not slowing as expected, and this phenomenon is now believed to be driven by “Dark Energy”, a mysterious repulsive substances that makes up 70% of the energy density of the Universe. This discovery was so profound it was awarded the Nobel Prize in Physics in 2011. At the ICG, cosmologists are involved in two major searches for new SNeIa, namely the Sloan Digital Sky Survey (SDSS; www.sdss.org) Supernova (SN) Survey and the Dark Energy Survey (DES) SN Survey. The SDSS survey is now finished and is now providing some of the best constraints on cosmology available today. 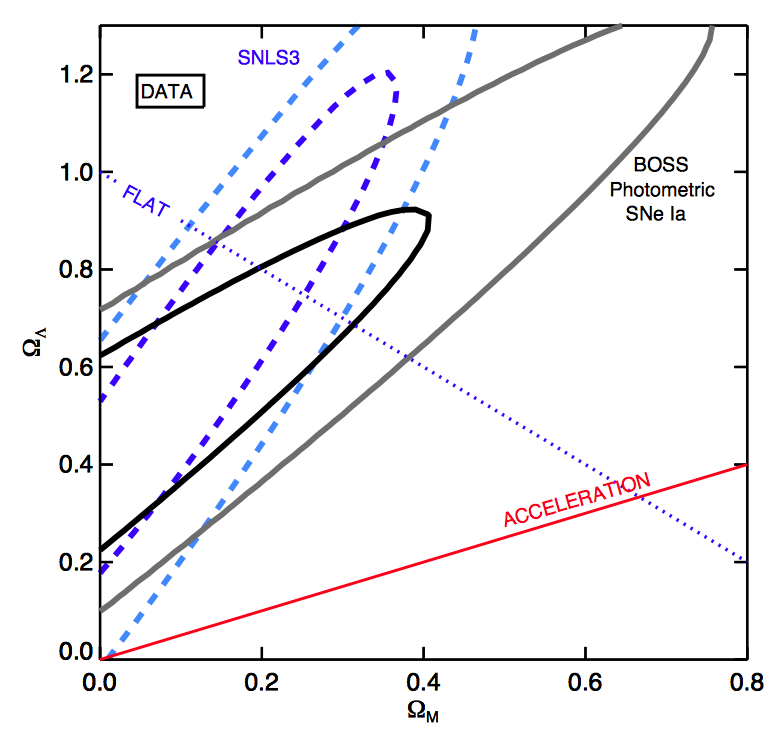 Moreover, ICG cosmologists have used the SDSS to extend our understand of SNeIa through their rates (Smith et al. 2012), their correlations with the host galaxy (Lampeitl et al. 2012) and techniques for performing photometric classification of SNeIa, which will be essential for future surveys (Campbell et al. 2013). DECam on the Blanco Telescope. DECam gained first light in 2012, and started the Dark Energy Survey in Sept 2013 including a new search for distant supernovae. DES will continue for 5 years. 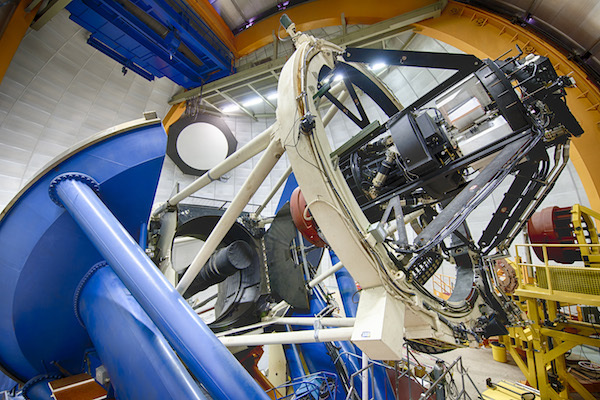 In September 2013, the DES SN Survey got underway using the 520 Megapixel Dark Energy Camera (DECam) on the Blanco Telescope in Chile. By surveying 30 square degrees of sky, DES is expected to find thousands of new SNeIa, increasing the number of known events by at least a factor of 5 (if not more). 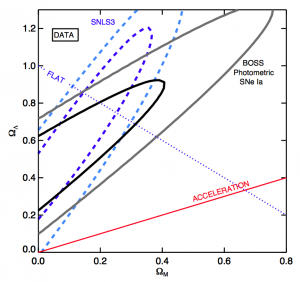 Moreover, DES is focused on improving the photometric measurements of each SN thus improving the distance estimates for each object and improving the overall cosmological constraints by hopefully a factor of 5 as well. DES is also expected to improve our knowledge of supernova astrophysics, through detailed studies of their rates and global properties. In addition, DES will find new phenomena e.g. superluminous supernova which appear to be up to a 100 times brighter than normal SNeIa, and only a handful of such transients are known today. SN Ia host galaxy properties from Sloan Digital Sky Survey-II spectroscopy, MNRAS Volume 435, Issue 2, p.1680-1700 (2013), Jonas Johansson, Daniel Thomas, Janine Pforr, Claudia Maraston, Robert C. Nichol, Mathew Smith, Hubert Lampeitl, Alessandra Beifiori, Ravi R. Gupta, Donald P. Schneider. The SDSS-II Supernova Survey: Parameterizing the Type Ia Supernova Rate as a Function of Host Galaxy Properties, The Astrophysical Journal, Volume 755, Issue 1, article id. 61, 24 pp. (2012), Mathew Smith, Robert C. Nichol, Benjamin Dilday, John Marriner, Richard Kessler, Bruce Bassett, David Cinabro, Joshua Frieman, Peter Garnavich, Saurabh W. Jha, Hubert Lampeitl, Masao Sako, Donald P. Schneider, Jesper Sollerman. The Effect of Host Galaxies on Type Ia Supernovae in the SDSS-II Supernova Survey, The Astrophysical Journal, Volume 722, Issue 1, pp. 566-576 (2010), Hubert Lampeitl, Mtthew Smith, Robert C. Nichol, Bruce Bassett, David Cinabro, Benjamin Dilday, Ryan J. Foley, Joshua A. Frieman, Peter M. Garnavich, Ariel Goobar, Myungshin Im, Saurabh W. Jha, John Marriner, Ramon Miquel, Jakob Nordin, Linda Östman, Adam G. Riess, Masao Sako, Donald P. Schneider, Jesper Sollerman, Maximilian Stritzinger.